We used to celebrate National Libraries Day. Now we celebrate National Libraries Week! It gives us a rally good chance to love and appreciate our local libraries, and show our appreciation to librarians and volunteers. Remember that libraries provide much more than just a wealth of free books for all ages. 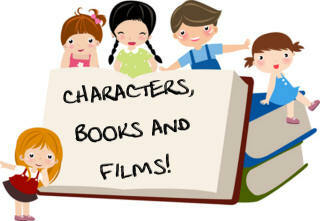 They provide community, a safe place, calm, friendship and, of course, story time! 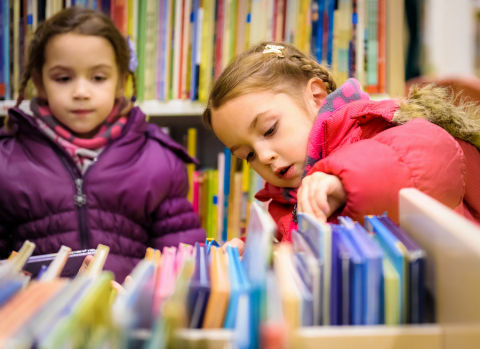 The dates of National Libraries Week in 2019 will be confirmed in January, but are likely to be around 14th - 18th October. Why not use National Libraries Week as an excuse for a visit? 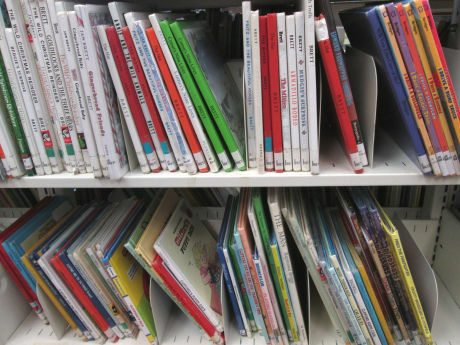 Libraries are under pressure, and if we don't use them, we might lose them. While you are there, find out about everything that's on offer and join up if you haven't already. Take out a book or two and a DVD perhaps. And say thank you to the librarians that work so hard to make it all possible! Here's a simple picture of a story book for kids to print and colour in. Just click the link below for our printable version. Here's a books colouring page featuring a stack of children's books to colour in. Here's a fun way to keep a reading list! Just get the kids to write the names of the books (and maybe the authors) on the spines and covers on the picture. Perhaps they could colour in each book as they read it? Children can trace the dotted lines of these books - quite tricky as there are lots of straight lines involved! Younger children could trace within the channel formed by the double lines instead. Here's a bookshelf full of children's books, spines outward - and it makes a really fun bookmarks for the kids to colour in and use themselves or gift to friends or siblings! Here's a fun bookshelf full of cookery books for the kids to colour in - and it makes a perfect little gift for them to give to any favourite adult cooks, especially with a nice message on the back! These bookmarks are quick to print and cut out and they look particularly nice if you use a punch to curve the corners and then laminate them. Perfect for any occasion, really - National Libraries Day, World Book Day, reading incentives or rewards in the classroom etc. It looks like these kids have some reading to do! Colour them in - and maybe write the names of your favourite books on the spines too? This lovely bright printable poster will brighten up the classroom, library or nursery, and hopefully remind children of how much fun it is to read books! You could even write your favourite titles on the spines with a fine tipped pen. Encouraging your child to read a wide variety of books is probably the best education you can give them - but sometimes it seems an uphill struggle! We have put together a collection of tips and tricks to encourage reading which may give you some ideas. This colouring card would make a lovely special greetings card for the kids to give mummy, teacher, librarian, babysitter or friend. Just print, fold and colour. You can adapt this lovely colouring page for any occasion that the kids want to say thank you to an adult woman - perhaps a teacher, a librarian, an auntie, a babysitter or a friend. Just write something on the card that the little girls is giving. If I could learn about anything at all, I would like to learn about.... Children can draw pictures or write about all the things they would most like to learn about using this open book printable. Here's a fun step by step tutorial teaching children how to draw a librarian - part of our professions and school series of learn to draw printables. Click below for the printable version. Available in either colour or black and white, this library books tracker will keep the family organised - and it looks great out on display, too. The colour version is best printed with your printer's borderless settings. You don't have to guess where these children are coming from - the library! They each have a good stack of books to read which will keep them busy for a while, as we hope this colouring page will do for your children! Help the librarian find her way through the maze to collect the book on the other side. If the book doesn't go back on the shelf, who will be able to borrow it? You might display this lovely colourful library poster at school or at home to remind kids to go to the library - or in the library itself! It prints best using your printer's borderless settings. Our library scavenger hunt is a brilliant way to get the kids involved at the library and help them discover everything that's on offer. 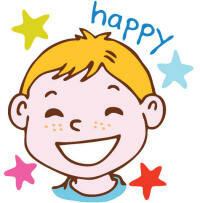 Print a page for each child, give them a pencil, and off they go! Libraries aren't just about borrowing books and reading. Here's a word search puzzle on a library theme for the kids to try. Hunt through our fun library word search puzzle to find the library-themed words! There's a picture for the kids to colour in too, if they like. Make a list of your favourite books and sign and date it. It will be fun to look back on in the future. Why not update the list once a year, on your birthday or World Book Day, perhaps? School books line the top and bottom of this bordered scrapbook paper design. Add a photo in the central section of the page, perhaps. This printable would also work well for a front cover, with space for you to write your own title. Do you know anybody who loves books? Then this is the card to give them - and they will love it even more because of the effort gone in to colouring it. There are lots of different types of story genres hidden in this word search. Can you find them all? 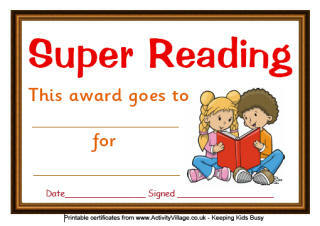 Here's a cute story time poster to display in your story corner or bring out when it is story time. Colour in this cute picture of a teacher reading with children on the story mat. Fold for a quick card. This colouring page shows the best part of the school day - when teacher gets out a story and reads to the children! Here's a lovely colouring page of a peaceful story time scene in the classroom. There's lots of detail to make it interesting to colour in. This lovely colouring page, designed for older children and adults, will strike a chord with all us book lovers! We've left a border around the outside so that you can frame it if you wish, once coloured in. Perfect for a library colouring page, perhaps? We love books, and we love the heart shape of this pretty book too! We thought it was the perfect backdrop to this lovely quote by Ernest Hemingway: "There is no friend as loyal as a book". The poster is best printed using your printer's borderless settings. We thought it would be fun to make a colouring page that reminded children that it's time to visit the library - so here it is! We have a poster, too. If your kids love to visit the library, they won't need this poster. If, however, they need a little prompting that it's time to visit the library - here's the poster for them! Q: Where do library books like to sleep? 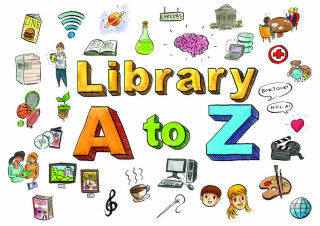 I found this lovely set of Library A to Z posters, which have been made freely available by The Library A to Z. You can find the posters here. 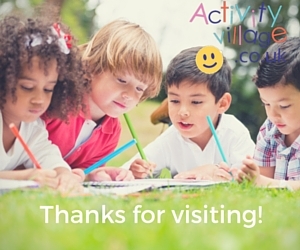 You will be leaving Activity Village if you click on either of these links.